Joan Jett once said, that “My guitar is not a thing. It is an extension of myself. It is who I am.” For New York based guitar collector, enthusiast and musician Errol Antzis , guitars are three dimensional, playable works of art. Spending his days as a financial advisor in digital and entertainment media and rocking out in his private recording studio at night, Antzis is the an unlikely rock star. He has released three albums under the moniker Psychoteria where he plays nearly every instrument in the Metal, Pop, Country and Rock genres. An accomplished musician, Antzis has amassed a stunning collection of the most unusual guitars you have never seen. 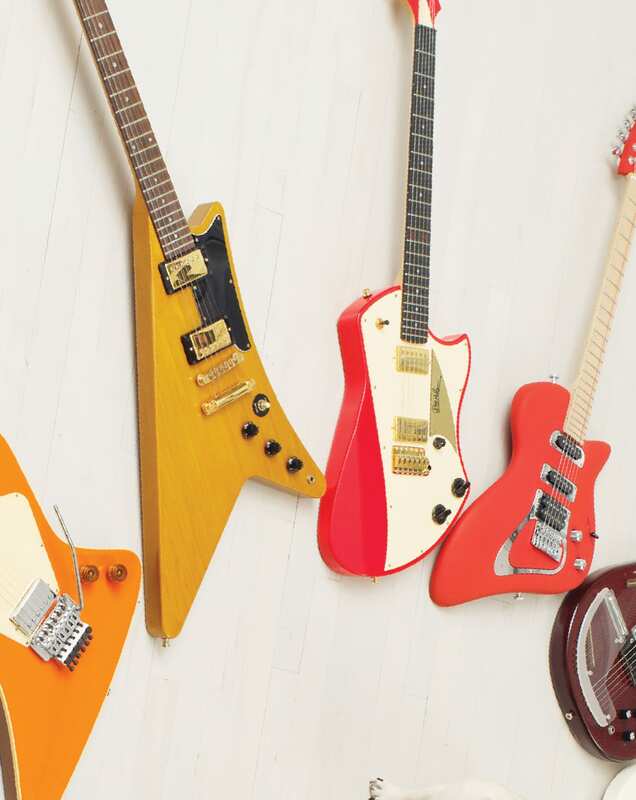 Installation Magazine: When did your guitar collection kick off? Errol Antzis: I started buying guitars when I was 14. I had one really inexpensive guitar that I got from a neighbor; I sanded it down, stripped it and repainted it four or five times. When my folks finally saw that I was really serious about playing, they were really nice and they said, ‘We’re going to get you the best guitar we can find.’ They took me to Sam Ash in White Plains and bought me a Gibson Les Paul Custom, which is, by any measure, one of the best guitars out there. That was my first good guitar. I still have that one. Later, I bought a Fender Strat along with a Fender amp from a friend. Suddenly I had two of the most famous electric guitar models in existence. When I got to college, I bought a white Flying V because one of my favorite guitarists, Michael Schenker, from the band UFO played one. Then I got a white double neck, because Jimmy Page played a double neck. I got an acoustic guitar when I was in college that was just laying around my fraternity house. I tracked down the original owner, one of the brothers who had graduated years before. He said ‘Oh yeah, you can have it for what I paid for it because I’m never going to use it.’ I think I paid $65 or something like that. It was this beautiful mahogany Martin. Oh yeah. I’ll never get rid of that. I have too many fond memories. 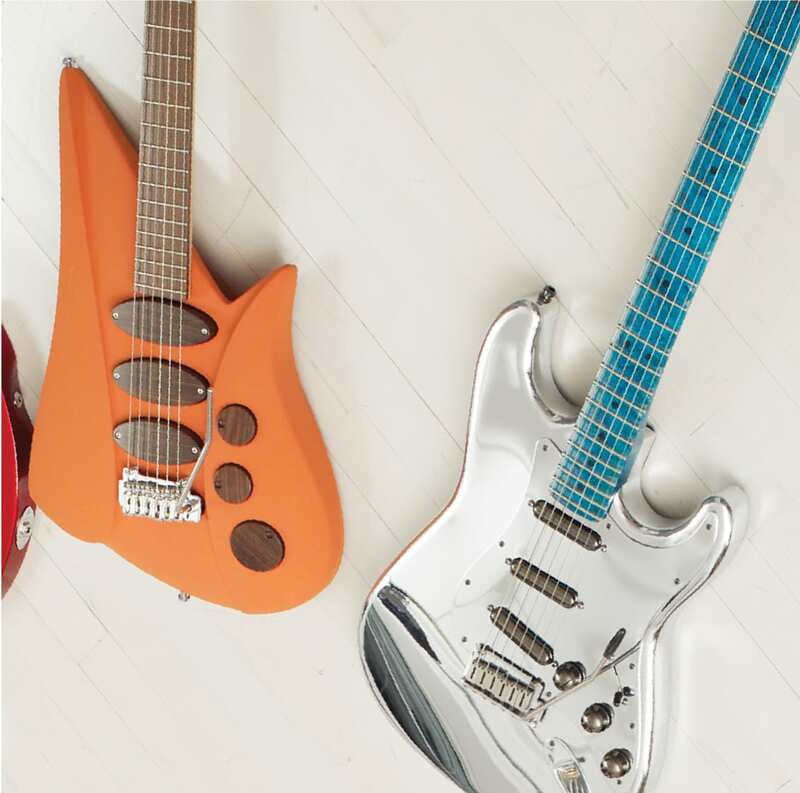 Your collection began with a focus on iconic guitars. I set out to get one of each of what I would call the “major food groups.” One Les Paul, one Strat, one Telly, one SG, one ES335, one Flying V. I set out to have about fifteen guitars. And I did that for quite a few years. But then, eBay happened and I was a goner. Suddenly, any guitar I could possibly imagine, that I could have any desire for, was either instantaneously available many times over, or if I put in a saved search, then something would pop up in a day, a week or a month. And that’s when I really dove in headfirst and started buying obsessively. But from there you started exploring unusual and rare guitars that resulted in the extensive collection that you have today. I own all of the Lucite and aluminum guitars that were made by major manufacturers. There are other aluminum and Lucite guitars that were made by small, unknown luthiers but you can’t go that route because then it never ends. When it comes to handmade guitars are you seeking out particular luthiers or are you drawn to their design aesthetic? The latter. I almost never seek out a specific luthier who I’m unaware of. I try to stay away from those avenues for two reasons: first, you could just go crazy and never stop, and second, the resale value on those is questionable because a lot of people who collect like to buy names they know. If you have an incredible guitar but it’s by someone no one ever heard of, it’s sometimes tough to find a buyer. I troll the Internet when I have a little time, and I look to see what’s out there. I’m just floored by how many fascinating guitars there are. Are all of your guitars manufactured by “big names” then? eBay is not your only source of discovering new guitars. I distinctly remember attending NAMM (the National Association of Music Merchants), a few years ago with you and there was unusual moon and oyster shaped guitar that you had ordered a year in advance. The Dean Uli Roth Sky guitar. It took two years to come. I think they made fifteen of them or something like that. Uli Roth is Metal/ Progressive guitarist who played with a band called The Scorpions and he was one of the reasons I started playing guitar in the first place. So, the moment I knew a signature model of his came out, which was the first one ever, I had to buy it. NAMM is also where you discovered the Teuffel guitars, which come with a customized stand so that they can be displayed like works of art. The big change was when I moved from getting guitars that I thought were great representations of the major types of electric guitars out there to buying them simply because I loved them as works of art. That’s what got dangerous, because there are a lot of really artful, well-made and nice playing guitars out there. That’s how I got into the Teuffel guitars and how I started collecting metal guitars and Lucite guitars and odd-shaped, amoebic type of guitars. One of the rarest guitars you have is the Kay guitar. Yes. The Kay Solo King. I saw that in an article in a magazine, it might have been Vintage Guitar Magazine. I just looked at it and I thought: ‘If Picasso were still alive, this is the type of guitar he would have designed.’ Of course, when I went searching for it, and there were absolutely none anywhere. It took years and years and years. I finally found it on eBay through an incredibly nice dealer. I’ve found a few great books about odd and unusual and rare guitars. I have four different books now that have a photo of the Kay Solo King and three of the four books have a photograph of mine. I can tell that the photographs are of mine because it’s pretty dinged up, and you can just tell the pattern of the dings are the same, as the patterns on mine. So there are at least two out there that I know of, but there may not be more. Living in Manhattan, you don’t have enough wall space to display all of your guitars at once so the guitars are always rotated. Sometimes I think about getting a house where I could have more space and a huge room to display all of my guitars. Because I really only have about five or six out at a time. If I haven’t played a guitar in a while, with as many as I have, sometimes, they don’t get played as often as I’d like. Sometimes when I take it out of the case, it’s like I just bought a new guitar because I haven’t played it in six months or more. That being said, I just went through a process of selling about six or seven guitars which was painful, but I think necessary. I bought so many last year and space constraints came into play. 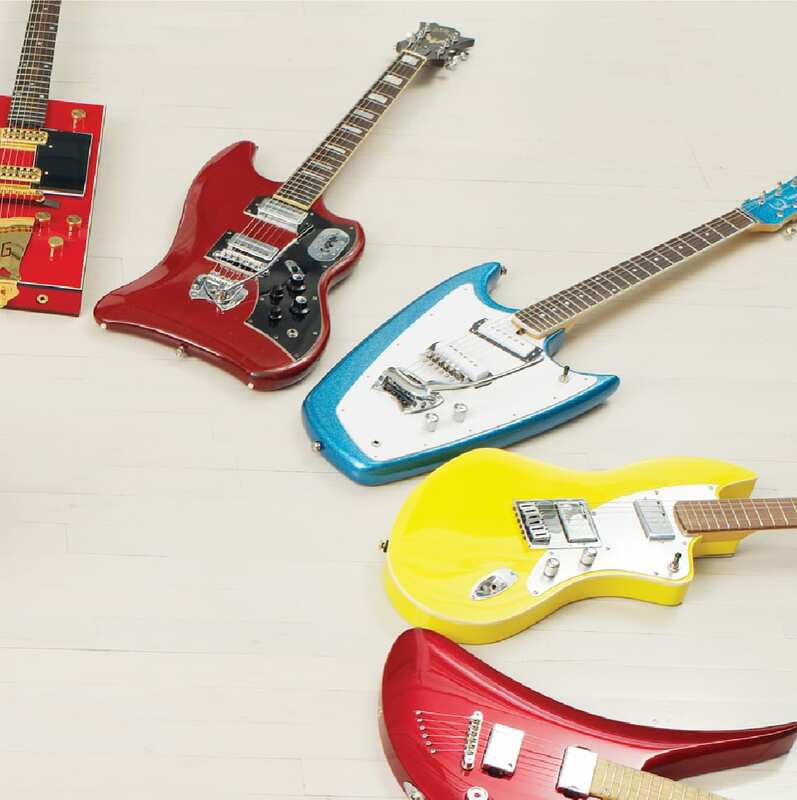 If you have three guitars that are all the same except for different colors, it’s like how crazy can you get? So I started pruning a little bit that way. How many guitars are currently in your collection? Unbelievable. I think I’ve seen more of your guitar cases than the actual guitars. How do you keep track of them all? I keep track of everything on a spreadsheet, complete with details of each guitar and prices. But I could probably sit down with you right now and if you give me a half an hour, I could probably write down almost every guitar I have from memory. And if I do that, and I can’t remember one that I have, I should probably sell it. Was there a particular guitar that you had to have but was impossible to get? It’s amazing that no matter how impossible you think some of them are to find, if you wait long enough, they eventually turn up. I’ve found that a lot of these guitars seem to turn up, in waves. Something will be impossible to find for several years, and suddenly you’ll find three or four that pop up on the market. This was the case when I was searching for a Jackson Roswell Rhoads, an aluminum body guitar that resembles the communicator that Captain Kirk used to wore in Star Trek. For some reason, during that particular period of time, three or four came up, and then they just disappeared. The back cover of your second solo album The Hard and the Soft, is truly representative of the diversity of your collection. Your dog, Baby sits in the middle of this incredible circle of instruments. Have you ever considered curating a show featuring your collection? I actually have, because it would be a way to make some money from this collection. And I’ve been exploring that with a neighbor of mine who owns an art gallery in West Chelsea. Doing an exhibit of aluminum guitars, or Lucite guitars or guitars with a particular shape, or by manufacturer. You could literally fill a gallery for an entire year. With one exhibition opening every six weeks. Yes, but it be a big, big undertaking. That is a show that I would definitely visit New York City to see.  Archived in Contemporary, Interior, Product and tagged Collection, Errol Antzis, Guitars, Iconic, Issue 07, Music, New York, Rare, Vintage. Bookmark the permalink.